I was tagged by my friend/blogger Adaku of ThirdWordProfashional to see what is in my bag. 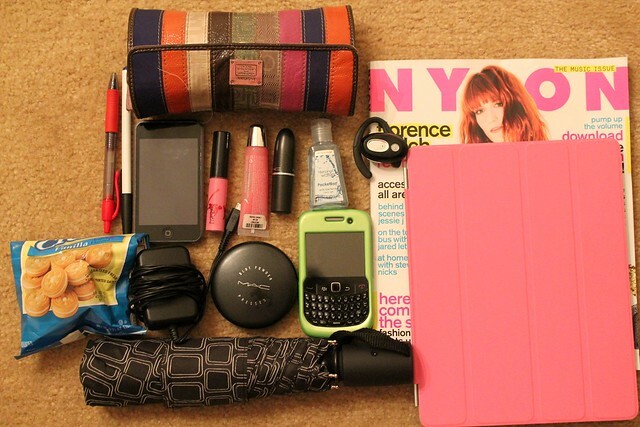 After I came back from the movies, I decided to do a quick post including a look at what is in my bag. 1. Take a picture of your bag. 2. Take a picture of its contents. 4. Tag as many bloggers as you want, that you'd like to see the contents of their bags. 1. MAC Ruby Woo lipstick & Mac studio fix: I carry a red lipstick with me at all time. I am obsessed with red lipstick. 7. Blackberry & charger: I have a hate/love relationship with this phone. It is constantly hitting the floor--thanks to my phone cover, it is still acting slightly normal. LOCA and also the WINNER of the Make up forever and Mac Lipstick--Whoop! Whoop! You are soooo stylish, I love this outfit. This is a nice post I find it interesting. Looove your romper! could pass for an ankara, so cute.. I love you outfit!!!!! and your bag! Great post - I'm the same with my Blackberry. I'm surprised it's not broken the amount of times I've dropped it! Gorgeous playsuit, I love the print. Fantastic outfit. From head to toe. I need me some oxfords/brogues in my future. Thank you for tagging me! Can't wait to do this post. I've always wanted to do one, actually. So cute! I love the romper. Its adorable on you. The blazer (of course I love it, I own it too). Your purse is uber chic & I'm really diggin the oxfords! Oh & thanks for picking me for the What's in my bag" series. I'll post it on my next outfit post! Cute outfit, love the pattern in the romper. OMG Stella!! I'm so excited and happy that I won! Woo Woo. I will do a post tonight of what is in my bag. 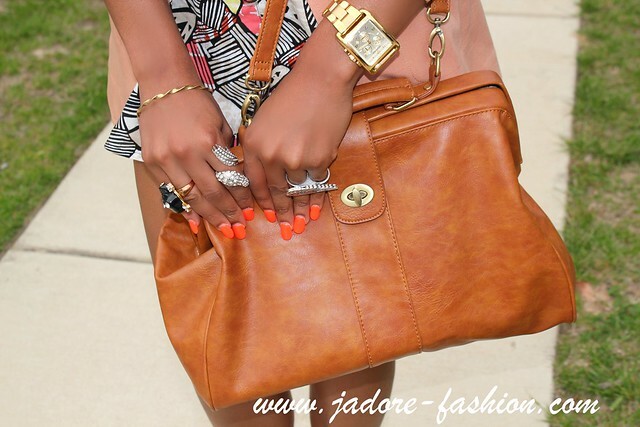 Jadore... Are u sure you want to know what I have in my bag? Love your iPad case I usually carry my e-reader with me when I know it's gonna be a wait too. a magazine/book is always a must. In my bag always: lipstick and Bobbi Brown powder foundation. Love the romper and blazer! WOW,I am totally in love with the entire outfit!! !You look so chic! Great outfit! Love the print of the romper and the tied belt. Very chic! Gorgeous outfit!! Love the accessories! I love the romper and the handbag. Cute look! A romper and a blazer is one of my favorite combinations! LOVE those shoes - adorable! Awesome bags other than promotional bags I love how everything in your purse has a great reason to be in there.